Military qualified fitness instructors are used to training in the dark and during bad weather, and as such have the skills and experience to keep the session rewarding and enjoyable; ensuring members keep getting the results that their hard earned cash and effort has paid for. Hydration: members should be advised on the importance of hydration prior to, during and post session (using an evidence-based approach). The six principles will now be discussed in greater detail. The human eye will, on average, take about 15 to 20 minutes to start getting accustomed to the dark. Therefore, during winter and evening sessions members should avoid looking at bright lights, prior to and during the session, to aid ‘night vision’. Most sessions are conducted close to built up areas that provide a decent amount of ambient light, adding to the natural light that may come from the moon. However, instructors should seek out the lighter parts of the area in which training will be conducted. Instructors should try to use naturally lit areas (e.g. moonlight) and/or artificially lit areas (e.g. playing field floodlights) as much as possible. Also, all instructors should be carrying some form of lighting, usually a torch on the front (white light) and back (red light) of their day sack, and wearing a reflective bib/jacket if not training in an adequately lit area. It is also advisable for members to wear reflective clothing and/or personal lighting. Should the weather turn bad during the session, the instructor should try to limit the effect of the elements by avoiding exposed areas. Depending on the location, this can be achieved by using overhead cover (e.g. trees) and/or keeping the group moving to aid heat generation and retention. Instructors, as a matter of course, should be informing their members about any risks and how to avoid them. This could include turning slowly on wet or slippery ground and/or watching out for low branches when running under or near trees. Competent instructors will have knowledge of usable areas within their location, for example non-icy or non-waterlogged areas. This may sound like common sense but it is important to note these safety and morale-sapping aspects. Training providers should have produced generic risk assessments for each of the venues where they operate – it is usually a condition of licensing – and adaptation of the generic risk assessments by instructors on the ground should be carried out to specifically reflect the current local environmental conditions and the fatigue levels of all individuals concerned. When we feel cold, wet and miserable there is a tendency to drink lots of hot drinks to ‘get warm and perk up’. However, it should be noted that tea and coffee are diuretics (i.e. you will need to go to the toilet more frequently) so you may also need to drink water before, during and/or after the session to remain hydrated. Deciding what is appropriate clothing is, essentially, a personal judgement call. Exercise clothing can be designed with style in mind rather than functionality, or a combination of both. Environmental factors, such as indoors/outdoors, sunny or raining will also be important. With this in mind the following offers some ideas on what may be deemed as appropriate clothing. Many members will travel to their boot camp direct from their place of work, whilst others come from their home. Regardless of origin, during the pre-session phase it is advisable that exercisers, weather dependent, wear warm and dry, long-length clothing (for example a track suit). Exercisers may wish to wear long-length clothing in order to provide protection from the sun or aid warmth in low temperatures. As such, exercisers are advised to wear a warm, dry jacket over the top of their bib until the very last minute before placing it in the designated vehicle; instructors are unlikely to have enough space in their day sacks to carry clothing. Do not forget, an exerciser will gradually warm-up during the warm-up phase of the session. If appropriate, it may be wise to apply sun cream at this point. The suitability of wearing waterproof garments will largely depend on the ability group level. Red ability group levels will probably benefit due to the lower intensity of the session. In contrast, the amber and green ability group levels may not benefit due to water build-up on the internal fabric as a result of sweating, although this is also dependent on other garments that are being worn and the level of intensity. As the extremities are typically the first parts of the body to get cold, a good pair of gloves and a hat are a good idea to keep your hands and head warm (a large amount of heat is lost through the head). Gloves can also act as a form of protection. As soon as the class is finished members should take off their bib and put on that warm, dry jacket again. In certain circumstances it may be advisable to bring a spare set of clothing due to the environmental conditions, i.e. raining or wet/muddy ground. There is no point in wearing warm, dry clothing over wet clothing as you will most likely remain cold. A bag or container for wet/muddy clothing, or even a car seat cover, will also be useful and will stop your vehicle from getting dirty. Suitability: if lower limb injuries are to be minimised, it is essential that training shoes are suitable for the activity undertaken. Many training shoes are specific to a particular activity; for example, flat tennis shoes are patently unsuitable for endurance running. The shoes must fit correctly and be in good condition. Wear and Tear: worn or damaged trainers will not provide essential support and protection for the feet and this may lead to problems throughout the lower limbs and the back. Whilst factors including, the individual’s size and weight, shoe maintenance and type of use will determine the life of training shoes, those in regular use should ideally be replaced if wear and tear is apparent. Daytime Sessions: try to do a daytime session whenever possible, even if it is once every other week. Training in the daylight even if it is cold and wet will always make you feel better, so make the effort. Training and Travelling with a Friend: find a friend to train and travel with. This way you can share your experiences with someone who knows how you feel and at the end have a laugh and a joke with them about ‘surviving’ the session. If you are worried about making your way into the park or home again during the winter mention it to the instructor; there will probably be someone else going the same way. Motivation and Those Winter Months: in the winter period it is so easy to miss a session, especially if the weather is bad and it is dark outside; you may talk yourself out of going. The hardest part about sessions in the winter is getting there, either because of poor road conditions or apathy with the cold weather. However, providing you can safely attend the session you will probably find that your instructor and other group members will aid in the provision of extrinsic motivation. Stopping Training: If you stop training through the winter you will undo all the good that will have been gained over the previous period and post-Christmas, or springtime, you will have to start again. Be strong mentally, keep training through the winter and you will remain strong physically. 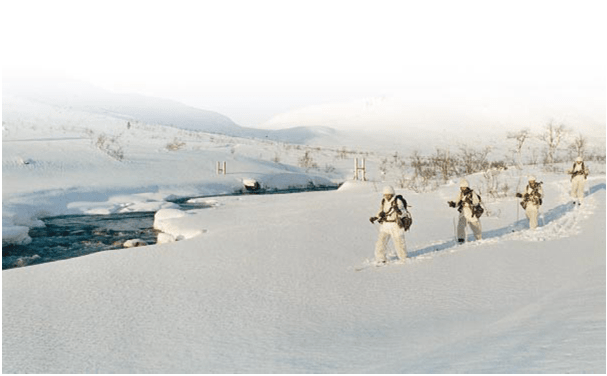 In a military environment soldiering requires troops to function effectively in all types of conditions, including hazardous climatic environments. Although this book is about civilian boot camps, the weather does not distinguish between military and non-military with regards to heat illness or cold weather injuries. As such, the intention is to provide some general information on preparation for and training in, adverse climatic conditions. The risk of heat illness should be considered in temperate climates like the UK as well as obvious places such as Australia. The western European climate can change considerably in a short time and it is then when exercisers are most at risk. Therefore, this section will focus on the effects of dehydration and offer advice to minimise its effect. Fitness professionals’ who do not have specific training and experience on the many other physical risks of operating in hot and humid conditions, e.g. sunburn and other dermatological conditions, should seek medical advice. The level of internal heat production when exercising or working. Repeated and prolonged exercise in hot conditions causes a gradual improvement in the ability of the body to dissipate heat. This occurs principally as a result of increased sweat rates and blood flow. An increase in the stroke volume of the heart aids the delivery of blood to the active muscles and skin when necessary. Utilisation of muscle glycogen will also decrease, core temperature will be better maintained and these effects will delay the onset of fatigue. An increase in the ability to absorb fluids may also occur. Acclimatisation can be achieved by exercising in the heat for up to an hour each day for 5-10 days. Cardiovascular acclimatisation should be experienced within 3-5 days, with the change in sweat mechanism usually taking 10 days or more. Further improvements in an individual’s ability to function can also take place by increased mental tolerance to the heat. Any exercise within the first few days of exposure to heat should be reduced to 60-70% of normal activity. Having already discussed what influences body heat loess and retention this section will look, briefly, at the physiological effects of exercising in a cold environment. Fitness professionals should be aware of their responsibility to assess each training session for risk prior to its commencement. Insulation: body fat is natural insulation. Individuals with a high percentage of body fat cope and perform better in cold environments, particularly in cold water. Clothing will obviously assist in maintaining body heat, but overdressing or leaving skin exposed, should be avoided. Metabolism: automatic increases in metabolic activity (i.e. shivering) and the re-distribution of circulating blood will occur if the body core temperature drops. Physical Activity: this produces heat and increases body temperature. However, the natural diversion of blood for insulation in cold climates could reduce muscle temperature resulting in impaired physical performance. Energy Supply: fat is not utilised as efficiently when the body core temperature is reduced. This can lead to an increased demand from glycogen stores. If fatigued, the body will not be able to maintain a high enough activity level; this may cause a drop in body temperature and increase the risk of hypothermia. Respiration: severe cold exposure can diminish the rate and volume of respiration. Damage to the lungs and respiratory tract does not occur because inspired cold air (even at -25°C) is warmed within a few centimetres of entering the nasal passage. However inhalation of cold air can cause respiratory tract irritation in susceptible individuals. Allow additional warming up time and avoid long stationary periods cooling down.